The product is expected to be ready for delivery this autumn. Please contact our customer service for more information. 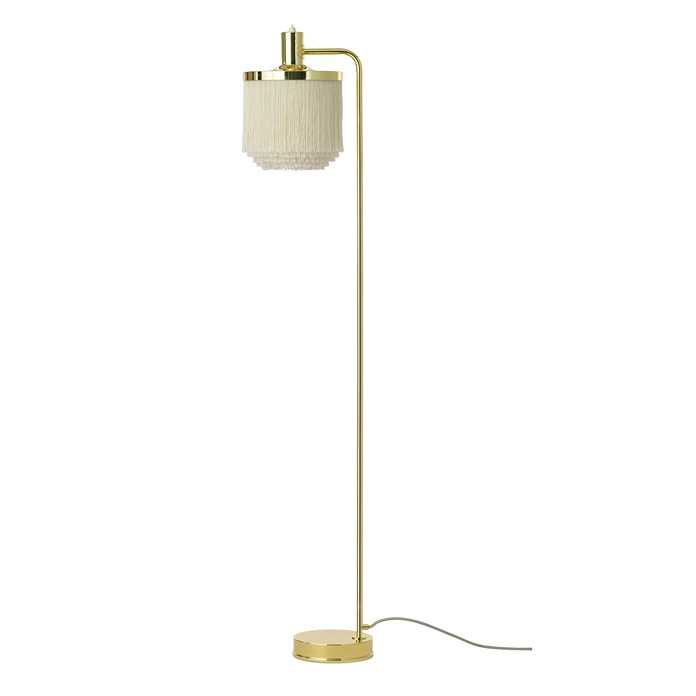 An iconic floor lamp with sophisticated fringes, created in 1960 by the acclaimed Swedish lighting genius, Hans-Agne Jakobsson, and now finally available for all those design lovers who were unsuccessful at auctions. Fringe is a timeless design statement, constructed to create warm, cosy lighting by means of the fringes that conceal the light source beautifully. This elegant floor lamp will grace any area of the home with its soft light and graceful appearance. It is the epitome of the Warm Nordic lifestyle. It will look equally sophisticated alongside a modern sofa or a 1950s armchair. The Fringe floor lamp evokes the interiors of the past, but in a simplified design with an eye for contrasts and exclusive materials. Solid, polished brass is combined with tactile fringes, which fall elegantly in several layers like a flowing skirt. It is a stunning, stylish detail that helped make the Fringe lamp a design icon. The table lamp uses LED light, which has low heat generation and a long service life. The Fringe lamps are a much admired design dating from the 1960s, when the Swedish lighting designer, Hans-Agne Jakobsson created an impressive range of 15 lamps on the basis of his fundamental design concept. He christened the range ‘Frans’ (the Swedish for ‘fringe’). The name lives on today and this designer lamp is much loved by collectors. 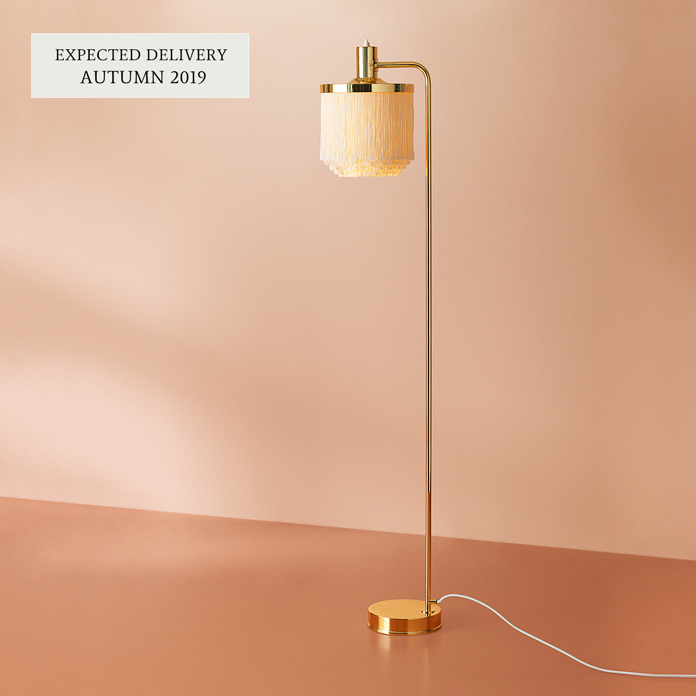 Warm Nordic have hand picked a number of lamps from the range. In addition to the floor lamp, there are a table lamp, a wall lamp and a pendant, all in Hans-Agne Jakobsson’s amazing design. Fringe is Scandinavian lamp design at its most outstanding and is rooted in Hans-Agne Jakobsson’s profound understanding of the endless diversity of lighting effects, which he refined during the 1950s, 1960s and 1970s in line with the strong Nordic lighting tradition. The Swedish lighting genius drew his inspiration for Fringe from the lavish sensuous style of the late 19th century. The Fringe floor lamp has been specially selected for the Warm Nordic range as a tribute to iconic Nordic design that invests modern décor with invaluable diversity and depth. The great Swedish designer, Hans-Agne Jakobsson was attracted by light. Starting in the 1950s and for more than 30 years he created original lamps that revolutionised Swedish lighting design. With a background in cabinet making and the world of architecture, shaping light with the use of materials and colours came naturally to him. Hans-Agne Jakobsson’s signature is a soft, warm, subdued light that is extremely pleasing to the eye. The lamps are created with classic materials such as glass, wooden laminate and brass, but also combined with sophisticated fringes in one of his more playful lamp designs, which today is considered an icon. Experiments, a wealth of detail and a profound understanding of the numerous aspects of light mean that each and every lamp is a shining work of art. Warm Nordic will regularly launch more of Hans-Agne Jakobsson’s extraordinary designs.